Game description: This is a story expanding three years of an extraordinary great wizard who was born in such age, the girls who become his pupils, a ruin from the old age, “Black Tower” that they live in, and the people that gather around them. The main character Domino became the 9th great wizard of the Grimoire Academy. It was a very special case for a young wizard to be so successful, but Domino soon grew tired of the Grimoire. The other great wizards were only seeing magic as means for personal success than an important research. The research of magic has been put off and all they were doing was fighting over authority. Domino left the capital and decided to live by himself in the sealed Black Tower on the frontier, rumored that a great wizard in the Age of Tower lived. But the other great wizards didn’t think well of that and gave him a test. That test was to “Raise a full fledged wizard within three years”. Normally it would take decades to raise a proper wizard. On top of that, the two students that he was suppose to look after, Aria Vancliff and Kaya Xavier, were two of the most troublesome girls in the academy. Will Domino be able to complete this difficult task. 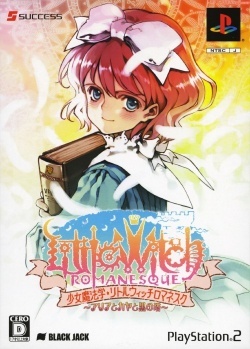 This game was remade and released in the US on PC as Girlish Grimoire Littlewitch Romanesque: Editio Regia which includes the PS2 version, as well as an Editio Perfecta which includes the PS2 version and an additional fandisc. This page was last edited on 15 April 2019, at 14:43.